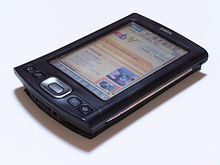 A personal deegital assistant (PDA), an aa kent as a haundheld PC, or personal data assistant, is a mobile device that functions as a personal information manager. ↑ Viken, Alexander (April 10, 2009). "The History of Personal Digital Assistants 1980 – 2000". Agile Mobility. Retrieved February 18, 2011. This page wis last eeditit on 18 Juin 2015, at 15:43.